While New England Timber Works prides itself in our traditions, one thing we do recognize as helpful for our clients are our customized 3-D renderings. Want to see what your new timber frame will look like prior to installation to make sure everything is spot-on? No problem. Take a look at a few of our latest renderings below. While we can build any timber frame dream of yours, below you’ll see five timber frame home plans New England Timber Works has designed and built that highlight and enhance timber frame building. Feel free to select from one of our high-quality, proven timber frame designs or work with us to custom build your dream home. To see examples of these post and beam floor plans as completed homes, please click here to visit our gallery. 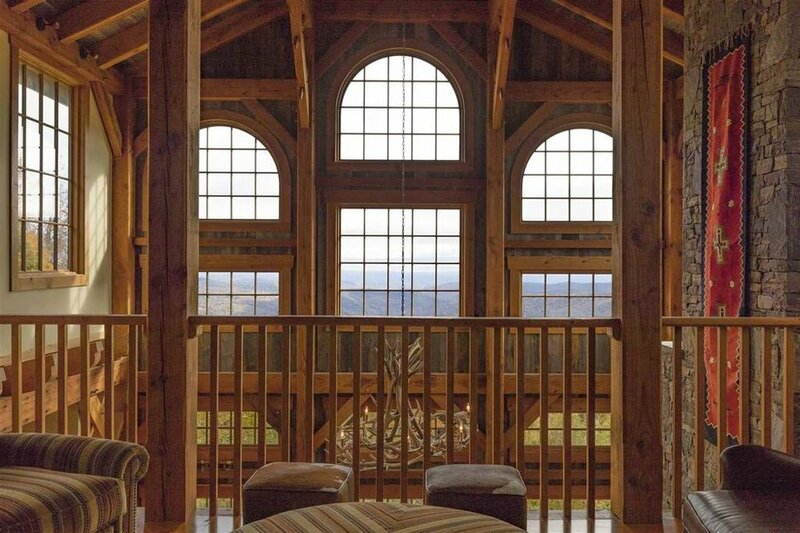 This timber frame is one our most popular and versatile timber frame designs. Originally designed to offer approximatley 1500 square feet of living space, we have built modified versions of this timber frame home plan ranging between 1400-1800 square feet. This two story model features 2 full bedrooms, with the addition of a large sleeping loft, as well as 2 full baths. A bright, open concept living/dining/kitchen is a welcome gathering area. The addition of a full walk out basement would allow for a wide variety of different options including extra bedrooms, a den for relaxing, game room for family fun, or a garage allowing additional storage space. This sweet home timber frame design is highlighted by a post and beam covered porch that beckons you to reflect and relax. One of our most spacious timber frame designs, this modified cape style has generous space for your family. The main level features stunning cathedral ceilings showcased by a walk through stairway that lends itself perfectly to the open and airy feel of this design. The master suite features a cathedral ceiling. large walk in wardrobe, and luxurious master bathroom complete with seperate stall shower, double vanity, oversized bathtub, and privacy stall. Work at home? The main level of this timber frame home plan also features a guest bedroom that could easily become an office space. The upper level offers 2 spacious bedrooms and a common bath. As depicted below, this larger home offers nearly 2300 square feet of living space. With the full basement, you have the option to add more than 1400 square feet of additional space. A beautiful home that is comfortable and easy to enjoy. This home features a compact footprint that is perfect for sloping lots. 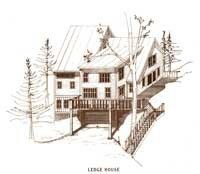 One of our well thought-out timber frame home plans, it offers two full levels of living. A striking corner fireplace and marvelous soaring open living space give this smaller structure the feeling of a much larger home. The timber frame home plan features a total of 3 bedrooms and 2.5 baths on two levels. This home can easily accomodate one floor living. An oversized single car garage is tucked convientley beneath, allowing for expansion room if you so desire. As depicted, this unique timber frame design is approximatley 1500 square feet in size. This magnificent home is externally reminiscent of the classic Vermont farmhouses scattered through the hills and valleys of Southern Vermont. Your eyes will be drawn to the intriguing rooflines as you approach this commanding home. As you enter, you will notice the intricacy of the beams and the unique double sided fireplace. Step through to the elegant "Cooks Kitchen", where you will find a large center island, perfect for informail dining. Enjoy the large dining area and year round sunroom that makes for a perfect breakfast knook, or a cozy corner for reading. A large office and guest room round out the main level of living. As you venture upstairs you will find the luxurious master suite featuring a two person oversized jetted tub, and a double shower with seating. A convienient chute leads to the laundry room below. The second bedroom on the upper level is quite spacious, and features its own private bath. Though not shown in these timber frame designs, this home also features a 2 car garage with plenty of space for storage, a den, and fourth bedroom on the lower level. 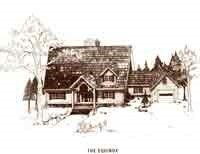 A visually beautiful home, it is one of our largest timber frame home plans at 3200 square feet. Designed for a growing family, this tremendous home offers 4 bedrooms, an oversized loft, and 3 1/2 bedrooms. The double sided fireplace is the highlight of the great room and dining room. The top level of this 3 story home features a master bedroom with large bathroom and seperate sitting area. On the fully furnished ground floor of this building, every inch of space is well utilized offering 3 bedrooms, 2 baths, and an optional family room. The rear of this home features an abundance of windows, highlighting the beauty of the outdoors, and filling the area with natural light. Decking along the back of this house is perfect for barbequeing and enjoying time amongst the tranquil surroundings. 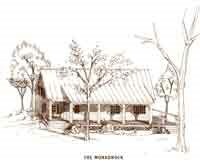 The perfect family retreat for generations to come in another of our ample and beautiful timber frame home plans.